Last week I returned from a 3 week solo trip to Kuala Lumpur Malaysia and Bali Indonesia. It was such a great trip that I actually forgot I had a job. Like 2 weeks into the trip I saw photos of a work potluck on Facebook and my brain clicked in and was like “oh right. You do actually have a job.” Part of my time in Bali was spent at a yoga/meditation retreat (which I’ll tell you about soon) and my work-related amnesia must have been due to some massive uncluttering of my brain. Either that, or I have early onset dementia. Hard to say. 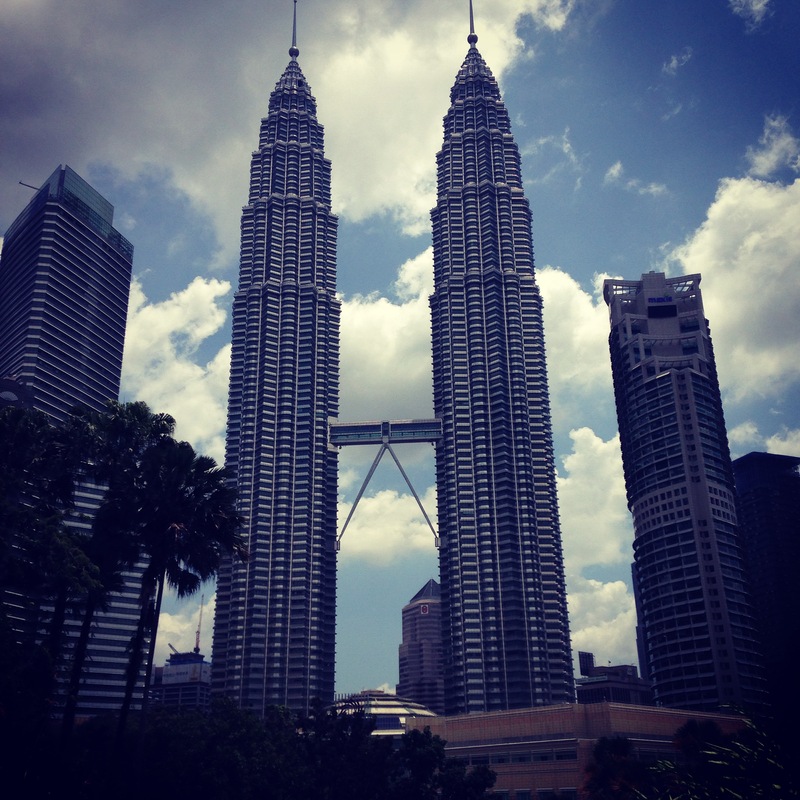 I flew from Riyadh to Abu Dhabi and then on to Kuala Lumpur via Emirates Air. Never having flown with them before I was super impressed, even more so after flying cargo class with Air Asia to Bali. 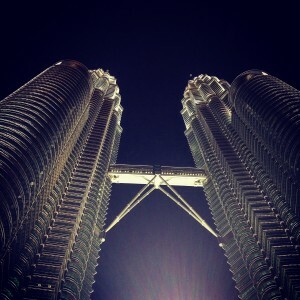 I spent 2 nights in Kuala Lumpur before going to Bali and 3 nights there on the tail end. 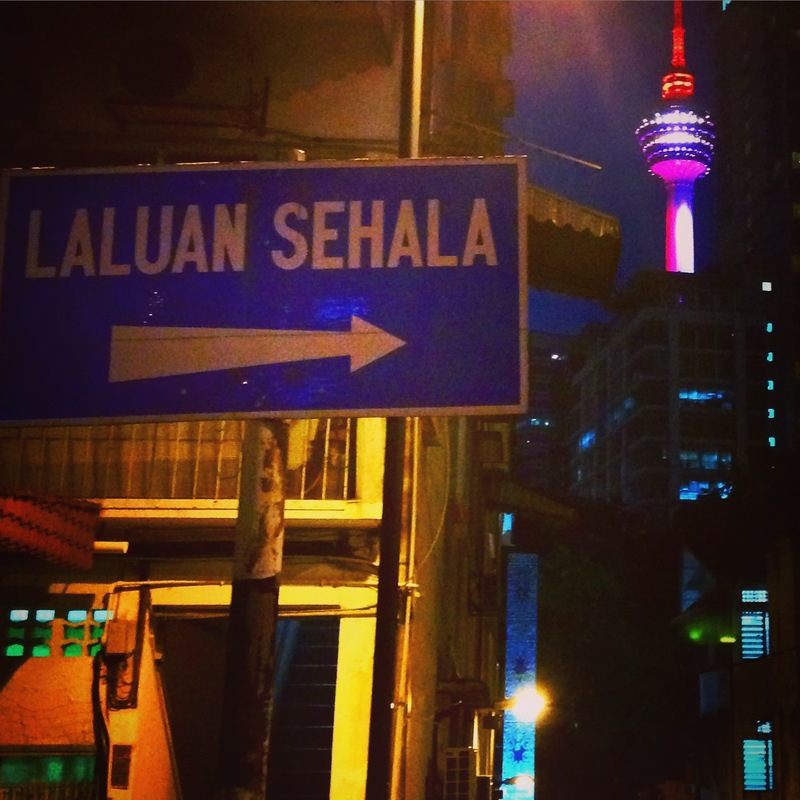 It’s no surprise that I liked Kuala Lumpur. I love bustling international cities. 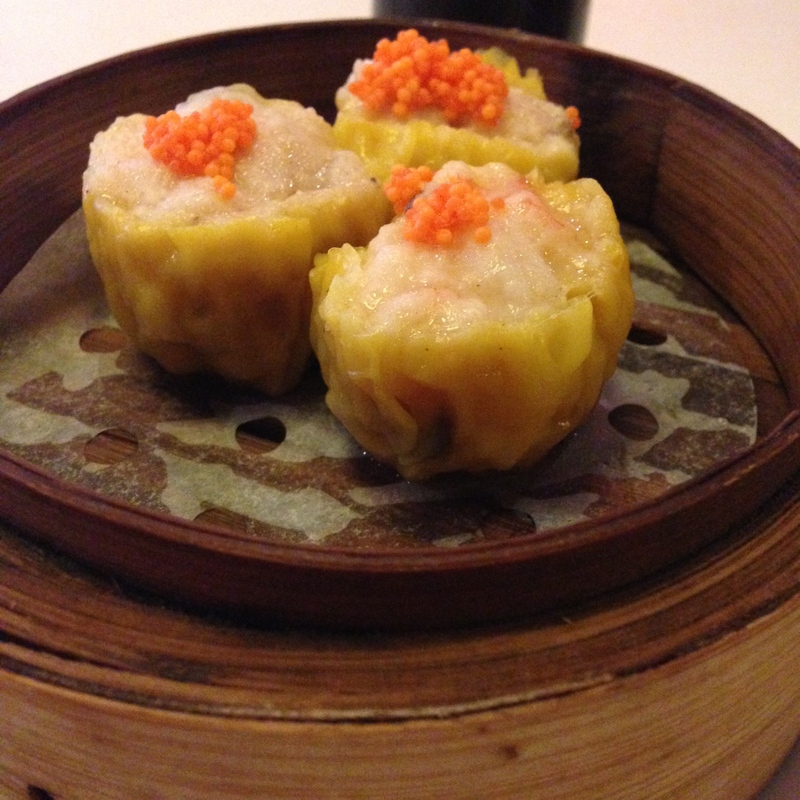 I love having great international cuisine and anywhere that has an abundance of bars. 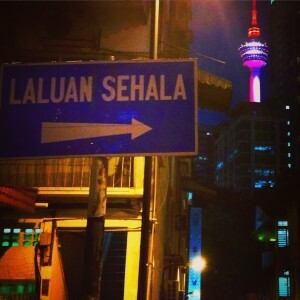 The first 2 nights I stayed in Bukit Bintang which is known as the shopping/entertainment district of KL. It’s very walkable, and I felt safe walking around as a single woman. 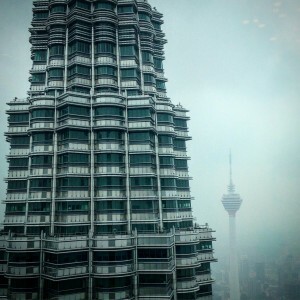 On my return I stayed in KLCC which is where the Petronas Towers are and Suria KLCC a great shopping mall. 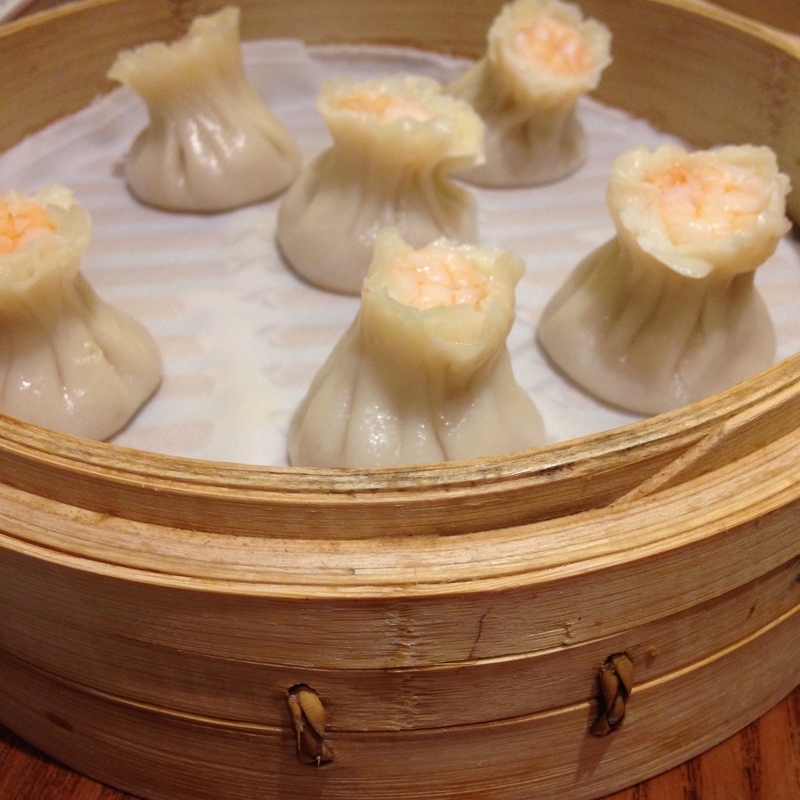 I spent my time in Kuala Lumpur eating some amazing food, and getting to pair it with wine or beer. This is one of the major things I miss while living in Saudi- I love to go out for nice food and have a nice glass/bottle of an adult beverage to go with it. I think I ate sushi like 3 or 4 times. I ate some delicious Chinese dim-sum. 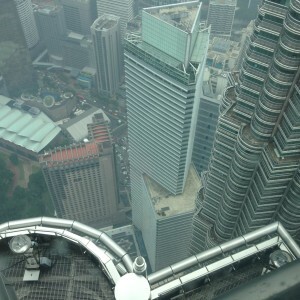 I went up the Petronas towers and checked out the aquarium nearby. I shopped and lost myself in a huge English bookstore. I saw a movie, which was great because by North American standards it was super cheap. They oddly played what I’m assuming is the Malaysian national anthem prior to the movie and everyone in the audience stood up from their seats until the song was over. That was a first for me. Mostly I spent my time doing normal everyday things that I would do if I weren’t living in Saudi. 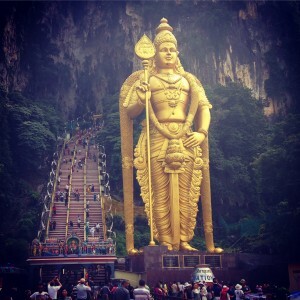 One morning I took a taxi to Batu Caves which are about 20-25min from the city center depending on traffic. You can reach the caves by train, but I was feeling super lazy and had lost my travel mojo at this point so I opted for a taxi. 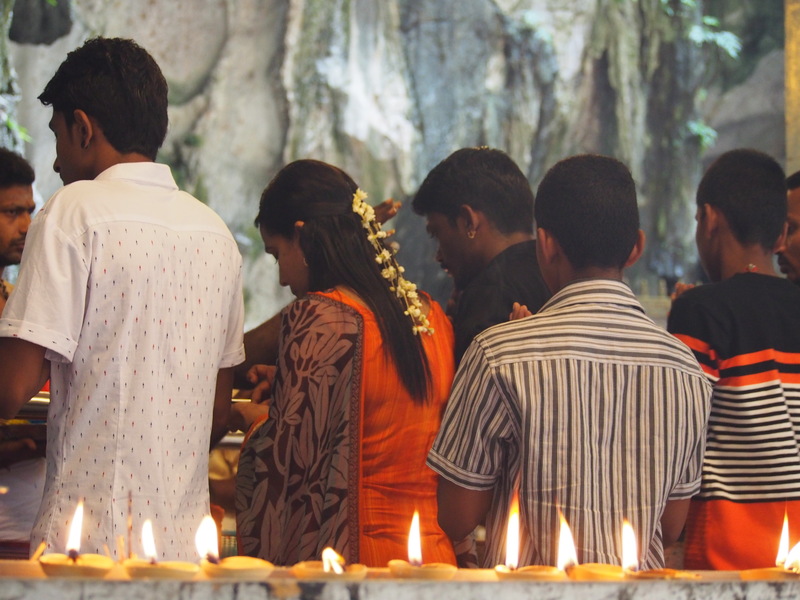 Batu Caves is a hugely popular Hindu shrine built into the side of a limestone hill. 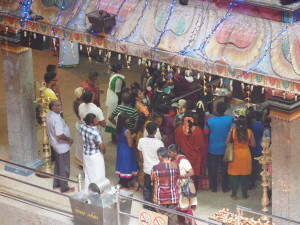 It’s a pilgrimage site for Hindu’s worldwide. 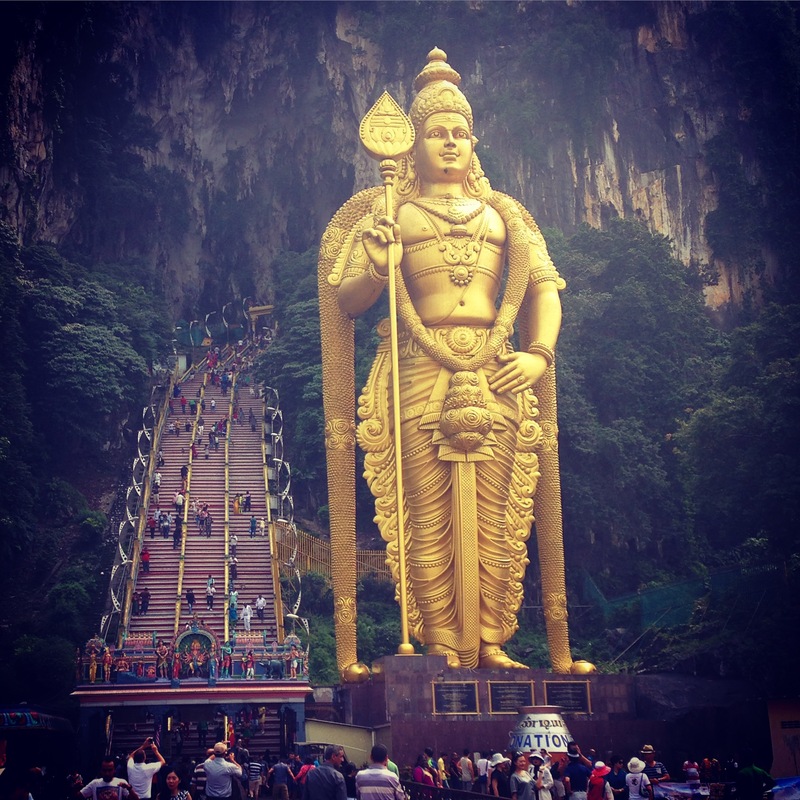 I’d seen pictures of the towering statue of Murugan with the staircase leading into the caves and it was at the top of my list of things to see while visiting Kuala Lumpur. The caves have served as a temple since the late 1800’s. 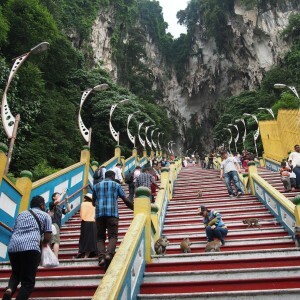 There are some 270 steps leading upwards into the cave. When I visited there were a pretty even mix of tourists and Hindu worshipers. 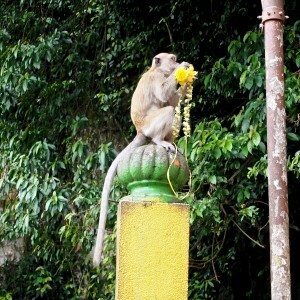 There were also numerous menacing thieving monkeys lining the railings leading into the cave. I really don’t like monkeys so I kept a close eye on them, and kept my things out of reach. Other visitors weren’t so lucky. I witnessed the monkeys steal bottles from babies. Seriously. 2 separate incidents of bottles full of milk were taken out of the innocent hands of babes. Others lost bags of fruit and hats. 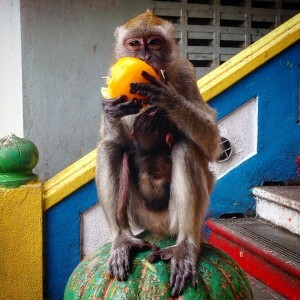 Pretty much anything a monkey could get their hands on. Don’t get me wrong- they’re super cute from a distance, but that’s where they can stay. 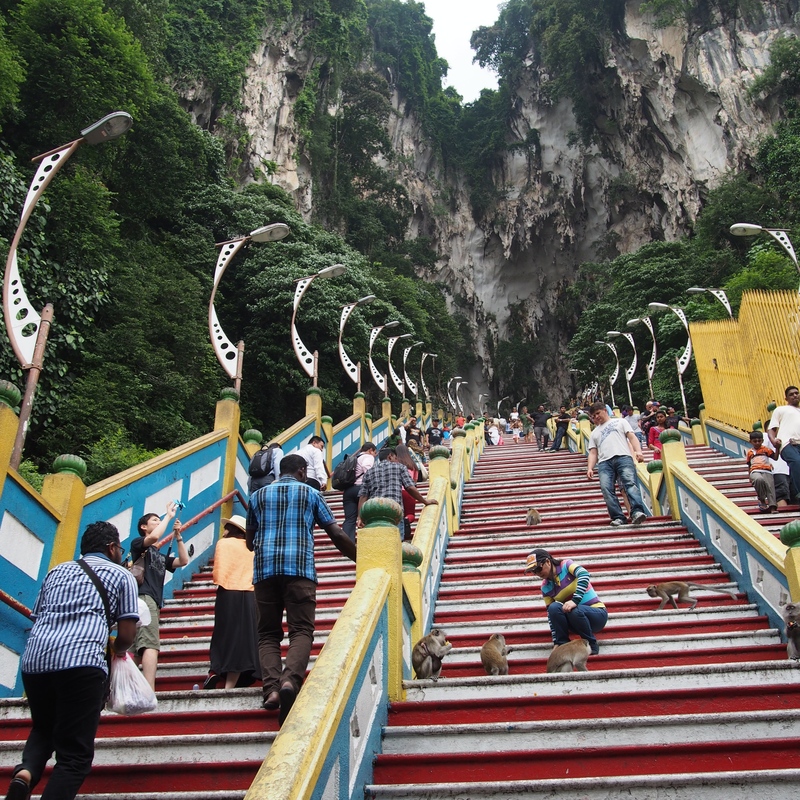 So up the steps you climb, and it’s really humid, so you’re sweating from pretty much everywhere. Coming up from the bottom the steps appear to just disappear into the darkness of the cave. It’s a very impressive view. Once you get into the main cave there is a temple off to the left and there are several statues of various Hindu gods tucked around the walls of the cave. 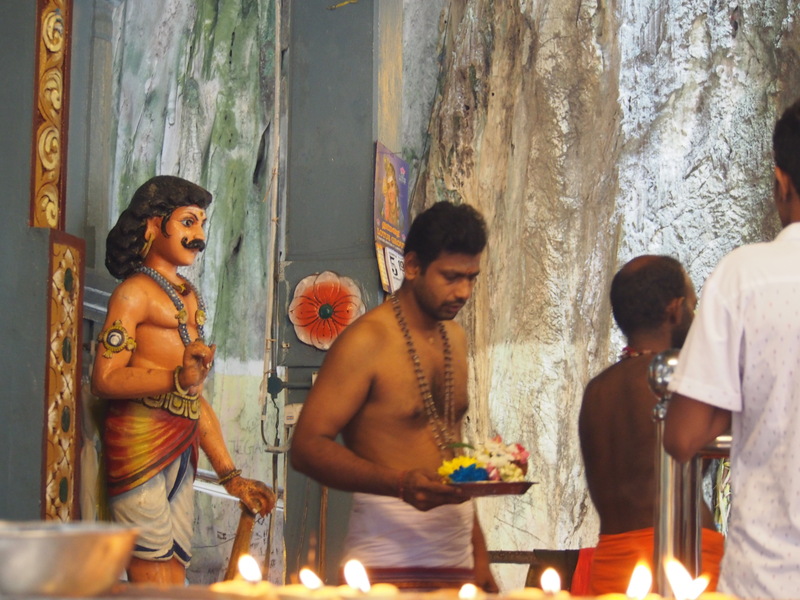 You then climb another smaller set of stairs which takes you into a smaller cave with another temple where Hindu worshipers were lined up to get Puja which involves making an offering and then getting a purification blessing from the priest. It was pretty surreal watching all the goings-on from the inside of a massive cave. Also the priests were all sporting 70’s style mustaches which are always a hit for me. 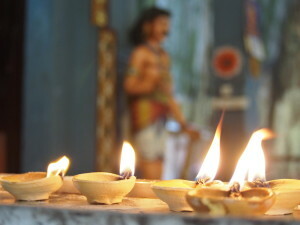 On the drive back into the city I had a unexpected chat about world religions with the taxi driver. 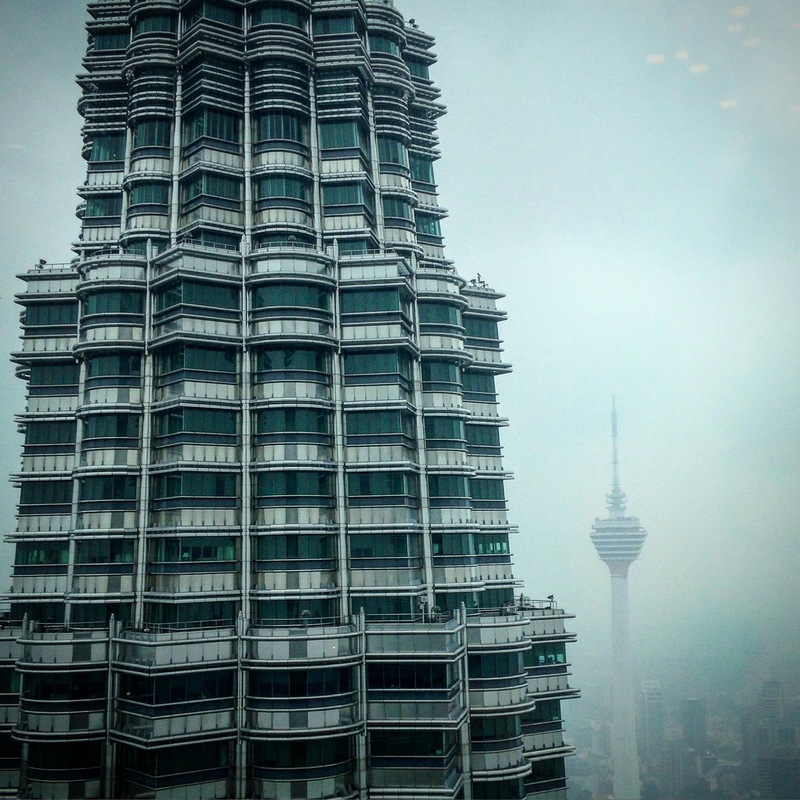 Malaysia is over 50% Muslim, almost 20% Buddhist, and then the remainder split between Hinduism, Christianity, and the various other Chinese religions. He asked me where I lived and I told him I was a Canadian, but that I lived in Saudi Arabia. He then asked if I was Muslim, I said no, and then asked him if he was. He replied “I like all religions but am none. All are the same.” I told him that back home we described this as being “spiritual but not religious.” He liked that phrase a lot. Chatting with him was one of those random and unexpected things that happens when you open yourself up to meeting people who you otherwise wouldn’t. 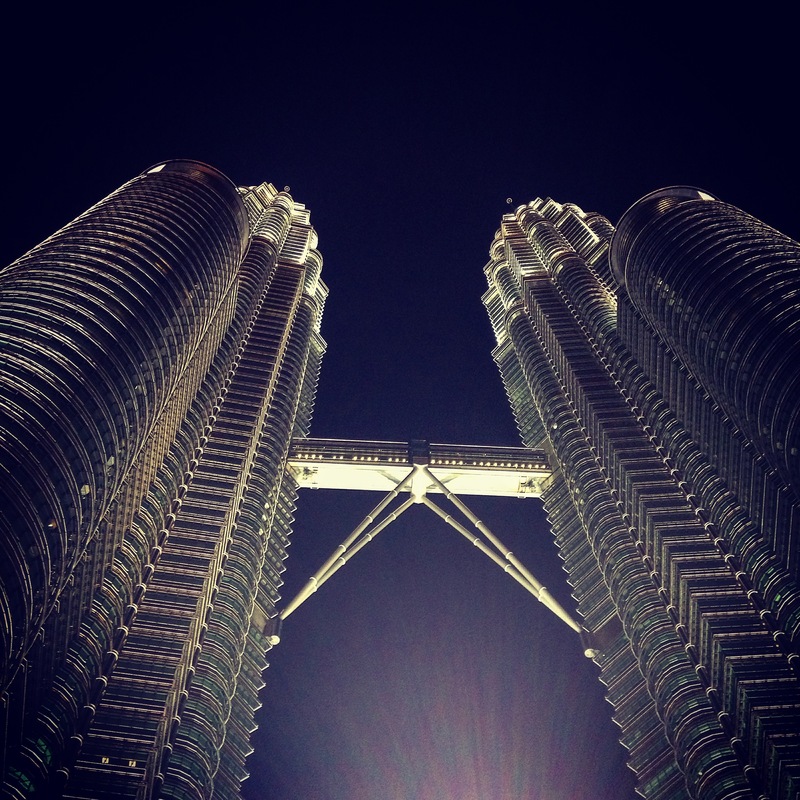 It’s one of the things I love the most about traveling. We all come from different backgrounds and places, but essentially we are all the same. Chatting with him reminded me of a song from one of my favourite artists Ingrid Michaelson called Blood Brothers. I’ll end this post with the lyrics from the chorus…..
Lastly, I just wanted to give a quick shout out to Expat Blog for featuring me as their Blog of the Month, and a Hello to my new readers, some of whom have sent me lovely messages. So thanks for reading. And don’t forget you can subscribe to get new blog posts in your email to the right-hand side of this post. Or you can follow me on Twitter or Instagram.